Lily isn't a big fan of sitting in her car seat. Even if its a short journey she sits there and says "im stuck". 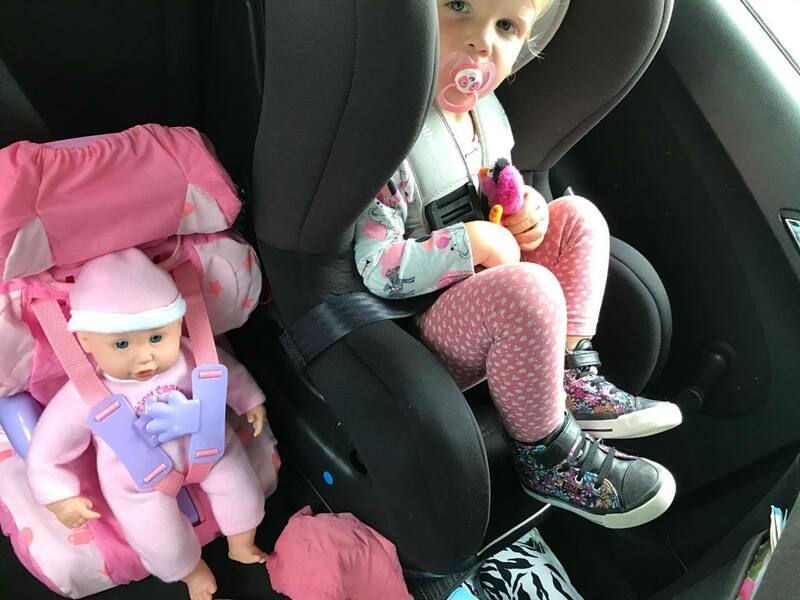 So when I got the chance to review the Baby Huggles Car seat from Casdon I was really happy and hoped it would help Lily be happier in the car. The box arrived and it looked great. 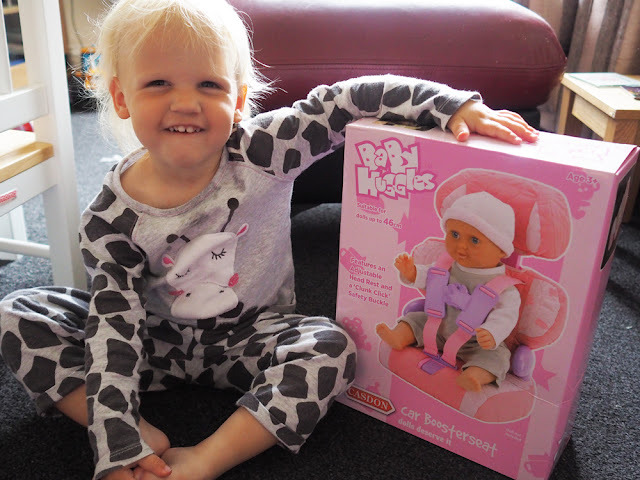 Lily was super excited to have a seat for her baby dolls. She was so excited that when she saw it that morning she wanted to open it straight away, which is why she is still in her Pjs in the Photo. When I opened it up I was surprised to see that it all had to be fitted toggether and all the material had to be placed on to. I had a very eager 2 year old waiting to play with it and wouldn't stop tugging at it while I was trying to put it toggether. So be warned that it may be easier to open this and put toggether without your child there. 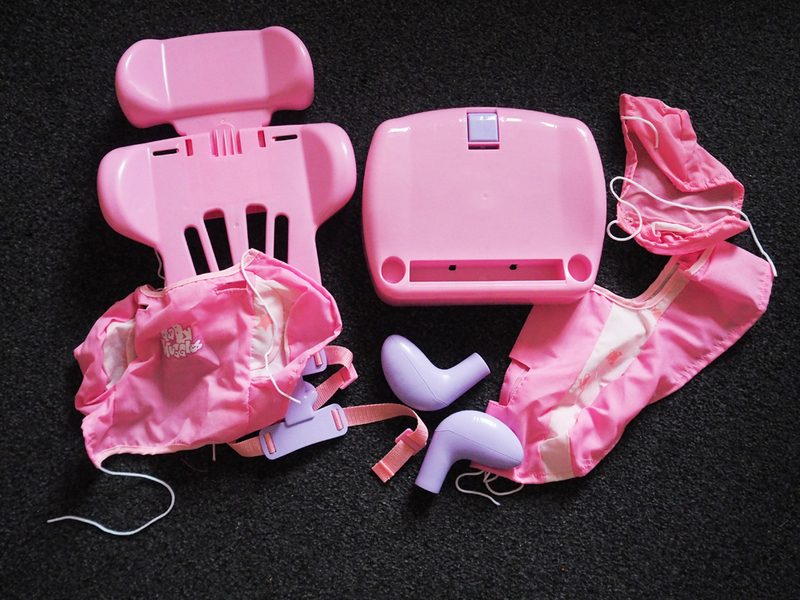 I found the plastic parts to the booster seat easy to put toggether and a simple shove of pieces toggether was all it took. But I didn't find the material easy to get on the seat. Especially because the drawstrings you pull to tighten it all on came out and I had to thread them back through. That was not an easy job. After that you needed to attach the car seat belt. That was quite easy but a little fiddly and took time, so again may be best if your child is not with you. Lily kept trying to help me. Which wasn't actually helping me. After you have put it all toggether it looked great and Lily got her dolly to put in it straight away. 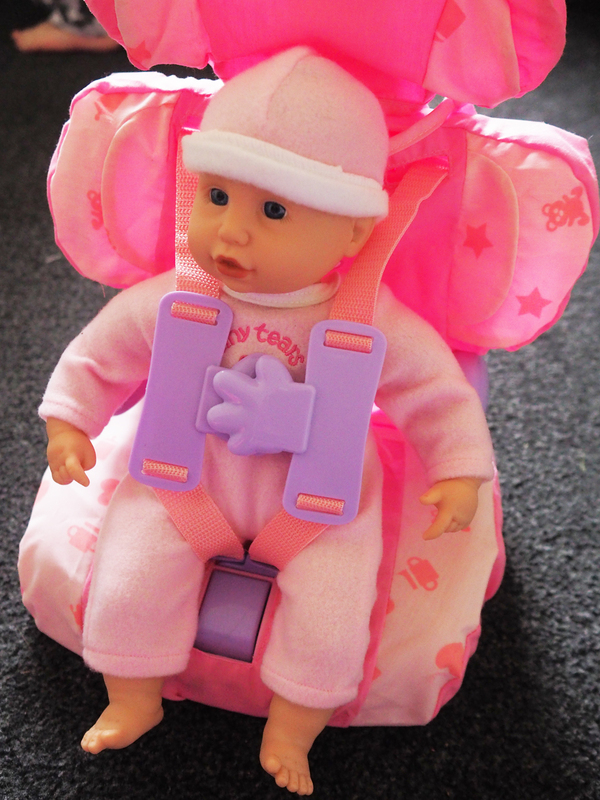 The doll sat nicely into the booster and the seat belt easily fastened with a push into the seat. The seatbelt also unfastens really easily to with a push of the button and pull of the straps. Lily carried her doll around the house feeding her and reading her stories until it was time to go out into the car. Please note that the doll is not Casdon's and doesn't come with the seat. When we got into the car I fasted the booster seat into the actual car with the real car seatbelt. Which just hooks onto the back. This is great because it makes the child feel like it is a real car seat just like theirs. This did keep it quite secure and it didn't more around anywhere. It looked great sat next to Lily and each time Lily mentioned she was stuck. We could tell her that the baby had her seat belt on to which seemed to reassure her. Lily has been playing with this lots since we opened it. She definetly is a fan of it. Some of the material loosened and kept falling off as she moved the car seat around the house. But luckily it just ties back on so its not a big deal, though I think I would have liked the material to be attached to the car seat a little better. But over all Lily's is happy with this toy and if she is happy, then I am happy. To find out where to buy the Booster seat which retails at £17 and is recommended for children aged 3+, Head to the Casdon Website. What do you like about the Casdon Dolls Booster seat? This is such a clever idea. I just wish it wasn't so pink. It would be nice to have a selection of colors to match the child's car seat. This is really great. She won't feel lonely at the back. A shame that it all had to be put together first, but it looks like she had loads of fun with it afterwards. Seems a great toy, lots of fun for a child. As well as likely assist in encouraging them in using child car seat / booster seat themselves. We want children to be safe and happy, this toy seems likely in assisting in those aspects. This toy appeals to me. I think it is a great idea. Though is there variety in regards to colours, etc. Being pregnant might be one of the most fantastic times in your life, but it can also be one of the most difficult in terms of planning and preparation, as there's so much to take in and consider, as well as an often substantial expense. Rather than pay out for the sherithat you want and need, often meaning you have a large outgoing, take a look at the following three steps on how to get the baby products you want without spending a fortune.